2. Prep the chicken: Cut the chicken into 8 pieces and pound the pieces until they are thin (for quick cooking and to make room for more filling). 3. Place the breadcrumbs in a shallow bowl with 2 tablespoons of Parmesan cheese and set aside. 4. Prep the filling: Chop the spinach and saute it with the garlic and just a drizzle of olive oil for 2-3 minutes or until just barely wilted. Combine the sauteed spinach with the ricotta, Parmesan cheese, and 2-3 tablespoons of the egg whites. Place the remaining egg whites in a separate shallow bowl and set aside. 5. Assemble the chicken: Oil the bottom of a large baking dish. Put a spoonful of ricotta-spinach filling right in the middle and roll the chicken up so that the edges meet to form a “seam”. Dip the entire chicken roll in egg whites, and then roll it in the breadcrumbs. Place in a baking dish, seam side down. Repeat for the remaining 7 pieces of chicken. Bake for 25 minutes. 6. Finishing touches: After 25 minutes, the chicken should be cooked through (white on the inside) and browned on the top. 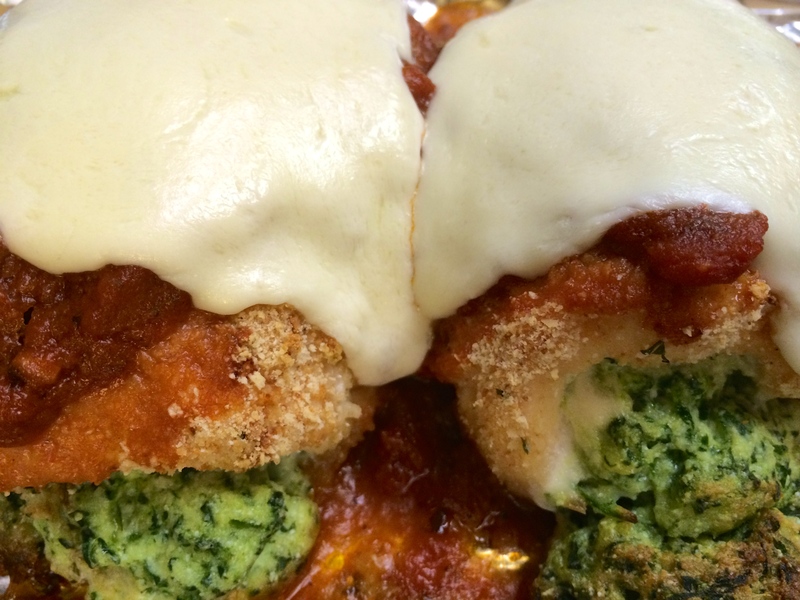 Cover the chicken with the marinara sauce and slices of fresh Mozzarella. Bake for another 3-5 minutes or until cheese is melted. One of my favorite, and easiest salads to-date! I am now officially obsessed with turkey bacon. This is a must try! 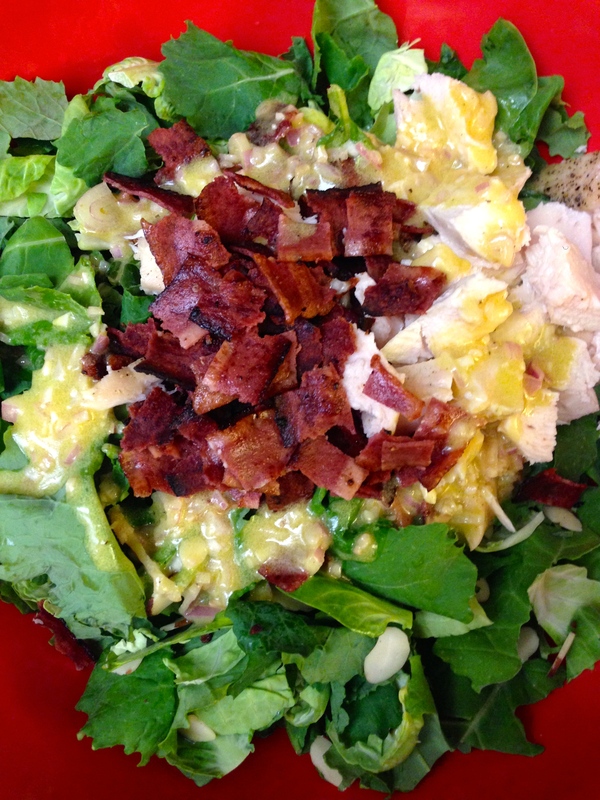 The best part about salads is that you can adjust the ingredients depending on your preference. I added chicken to mine (and extra turkey bacon)! Combine all dressing ingredients in a small bowl and mix. (Alternatively, I sometimes throw everything in a mini food processor and let it do the chopping.) Add in olive oil, whisking (or processing) until combined. Note: I added chicken breast into my salad for extra protein. And as usual, I made double the amount because this salad was just as good the day after! This chicken recipe is so easy and so yummy! I love anything lemon and my husband love tomatoes so I knew this was a healthy choice for us. Also, using hummus to coat the chicken was a great way to cut down the fat. The best part is that this dish takes only 30 minutes to make! Preheat oven to 450 degrees. Arrange the sliced onions at the bottom of a 9×13 baking dish. In a bowl, coat chicken in hummus and transfer to baking dish on top of onions. 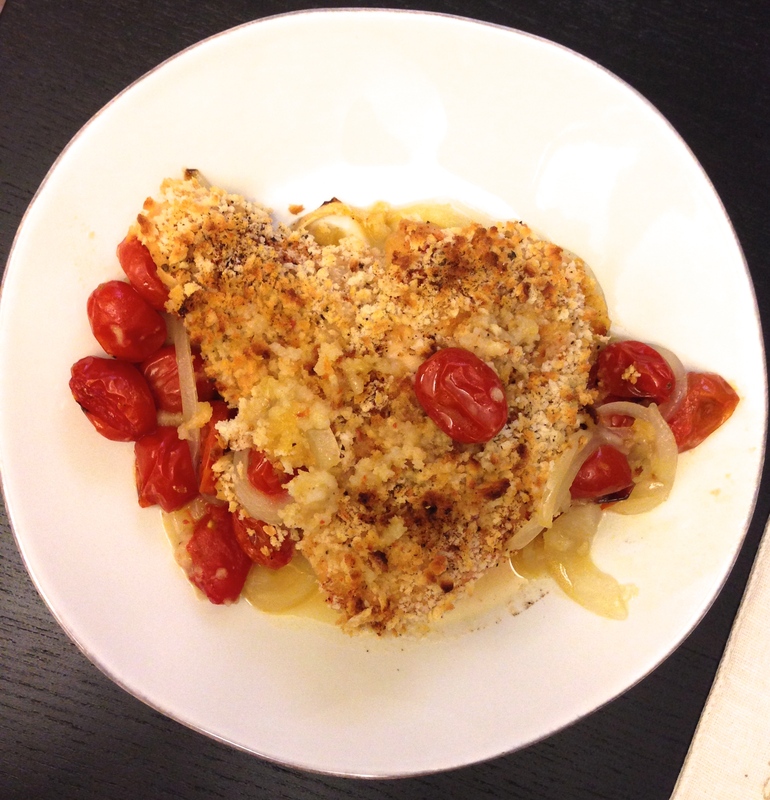 Drizzle chicken breasts with lemon juice and top with panko, paprika, and salt & pepper.